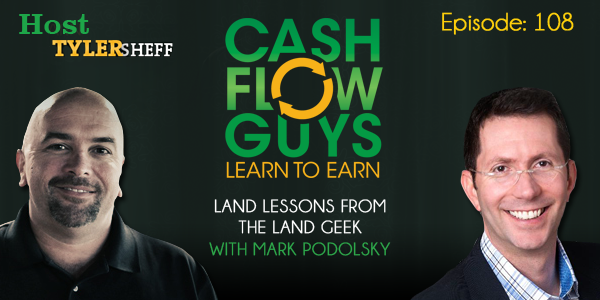 Today I am talking with the “Land Geek” himself, Mark Podolsky. Mark became an investor after a long stint as an unhappy investment banker with a 45-minute commute one-way. Mark was approached by a fellow employee who claimed to be flipping land and making a 300% return. Mark decided to give it a try and got the same results! Over the next six months, Mark made over $90k in the investing market PART TIME. What Mark does is find land that has outstanding taxes owed on it, for two reasons. First, it means the owner has stopped caring about the property. Second, because the owner has no emotional attachment to the property anymore. With some good due diligence, Mark then makes an offer to the current owner. After he gets control of the property, he taps into a little-known market of potential buyers: the neighbors. The neighbors are often interested in preserving their privacy and expanding their holdings, so many times at least one will opt in to buy before the property goes on the market. In this way, Mark has built a huge passive income stream and business that only requires his attention for 2 hours A WEEK. Mark recommends to get started, make 20 offers a day. Look at comparable sales and offer ¼; i.e. if a similar property has sold for $10,000, the most you can offer is $2,500. If you want to see the same software Mark uses to advertise his deals, visit PostingDomination.com/TheLandGeek. Also be sure to head on over to TheLandGeek.com to download his FREE ebooks and listen to his podcast. If you email support@TheLandGeek.com and mention “Tyler Sheff” in the subject line, Mark’s team will send you their $97 Passive Launch Income Kit for FREE! Don’t forget to visit us online at CashFlowGuys.com to see what we’re doing next, and book time with Tyler himself at CashFlowGuys.com/AskTyler or join the Facebook community at CashFlowGuys.com/Group. Please leave us some feedback on your favorite podcast player so we know we’re answering your questions and giving you the best content we can every week.